nzfreestyler had the most liked content! I think P1ng74 said it well. Don't over complicate the process. I wear dresses all the time and its not hard to find a dress that suits your figure. Its much harder to shop for dresses than separates because a dress shows more faults in the wearer but there are some basic rules - and to be honest a lot of women don't get it right. I'd say go for a just below the knee hemline to start - this is the most flattering hem length on ALL body types and looks good on all legs. It is best practice to have some gap between boot and hem so a knee boot with a just above the knee skirt, a short skirt with otk boots. These rules aren't gospel but it creates a more refined look. Go for an A-line shift dress - the easiest dress to wear - or an a-line skirt of same hem length. Be sure to wear a fitted top - you must make your top half less bulky and then let the skirt part flow out. Denim/Corduroy are great casual skirt materials - but a dress - I would recommend a heavier fabric - lined dress so it is a little stiff and holds a nice shape better. Don't go for a lightweight summer style dress to begin. Try to keep hosiery lighter than skirt/dress/heels. If hosiery is darker than a skirt/dress make sure your shoes are the same colour as you hosiery. hope that helps a little? excellent work! If my opinion is worth anything - I love it. Ornamented toe too? And clock heels are on trend too ! Knee high hosiery - stockings are uncomfortable under pants? I reckon go bare feet too - would look great as well. Nice. I am looking for a leather dress - mid thigh but with capped sleeves - or perhaps 1/2 sleeves to my elbows, simple lines - high boatneck style with the back high or v, possible scooped out a little - but I hopefully will find a nice dress. Where may I ask - did you procure that little no ? I love the dress and heels but I am not sure about the gloves? From experience your hemline should be just ok for general wear, better keep those legs crossed and/or a hand on the top of your hem when sitting - and you're wearing hosiery so you'll be fine anyway. About your dress - is fully lined I presume? - and sleeveless or cap sleeve? I have seen some neat capped sleeve leather dresses (boatneck style) lately. interesting... I wear high heels in the kitchen - only low heels - because they're comfier than flats when I'm standing still my feet hurt in flats after 10-15 mins. High heeled sneakers perhaps? Just kidding. I love the red pumps ! A classic pump in patent red is just gorgeous as a pop of colour ! Nice height too! Its surprising how well red can work with a lot of outfits. I reckon pumps look the best ! Just my biased opinion. Keep up the good work. I do like this look - I used to wear styles like this (except with a pump) before I branched into a skirt. Its a good look - well done. Nicely tone on tone ! How are oxfords like to wear - I presume you wear them barefooted - or with hosiery footsies ? I've never worn an oxford. 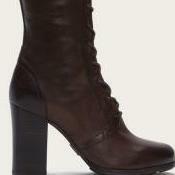 I find that the heels are often quarter an inch higher in a 4 inch heel - and I am EU 40/41 depending on the toe/height. I find a 5 inch pump quite enough for all day - 4 is my favourite I think - but a lot of you folk here wear 6's a lot and for me they are really really high for wearing for any long period of time. I have some ballet heels and they are 6.5 inches for me when I measure the heel - so for me I physically can't wear a heel as tall as 6-7 inches without it being a ballet style - and those aren't really made for normal wear obviously! I think one has to be careful not to generalise too much. When saying women complain about heels - not all women do, some do, and what shoes are we talking about - the term 'heels' is not specific. I wear heels all the time, I understand why women would complain - many wear heels because they feel they should - and womens fashion requires heels if you want to be trendy or go-ahead etc. Try wearing a pump - 4 inch heel in a stiletto - or even a narrowish heel for a week and see how you find it. Doing shopping, carrying stuff, hanging out the washing, running erands at lunchtime, climbing stairs at work rather than using the lift. Then you've got the hazards of wet floors, slipper lino in dept stores, uneven footpatchs, downhill gradients, rough pavements that are a pian to fine stilettos, slippery marble floors, stairs and escalators in heels. Getting on buses, balancing standing in trains etc - commuting in crowds in heels And then when you wear heels everyone looks - so you have to put up with that too. In winter in pumps even with hosiery you can get cold toes because the shoe is much finer than mens shoes or sneakers are. Then you've got the pointy toe to contend with and you do get used to them - but it takes a bit of wearing of pointy toes... While heels are fun - they are hard work. You have to want them more than the inconience. If you're into heels of course you choose to wear them. But what if you can't be bothered - women still feel pressured to wear them because its what is expected. Men don't have this issue because their shoes are all boring and flat. We can't really compare on any general basis. lucky you JeffB !!! Summer is obviously approaching - and for me down here we're heading out of summer !! I'm going to have to break out my stockings & coats soon !